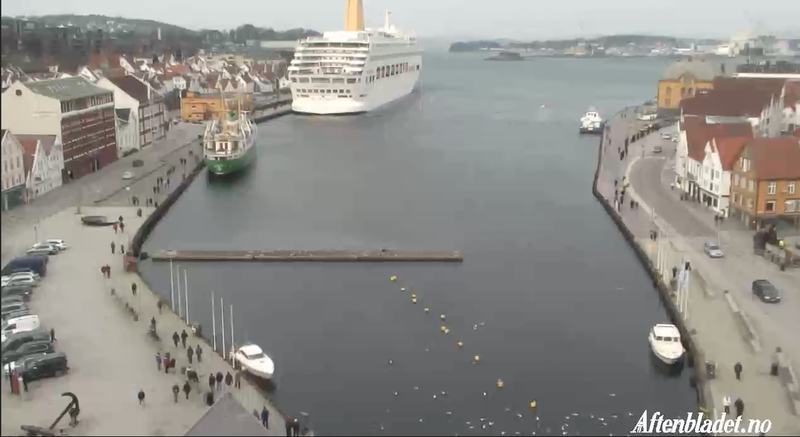 This is Oriana in Stavanger, about 12:15 today. She arrived there between 9:30 and 10 o’clock this morning, about 3 hours or so late – not bad, given that she left Southampton almost 12 hours behind schedule yesterday. Here’s a link to the streaming webcam from which I snatched this image. We have just returned (30th May 2014) from a cruise up the coast of Norway and the vibration in the Oriental Restaurant was so bad everything on the table was jumping around, and the noise. !! !it was a job to talk across the table. to other passengers.. poss cavitation of the props. !!! Thanks for the comment, Martin. Oriana has history in this regard, I think. There were references to requiring some work on a propeller shaft at the end of world cruise a couple of years ago, I think. That said, it’s also the case that Oriana’s propulsion mechanism is different from all the other ships’: she has very traditional mechanical drive taken off diesel engines in some way. All the other ships use an electric motor powered by electricity generated by the diesels. Was this all the time or just when she was making a high speed?